Kids started the church year at the downtown UU church. Avery started at “Junior Preschool” which is another way to say “Childcare for kids who aren’t babies.” He is in a new, larger room and his teacher is James, who does not know sign but seems nice enough. There were cars so that helped. He was a little hesitant at first, but he did not do too badly for his first day in a new room with new people. Aaron and Naim went to their 1st/2nd grade classrooms. They are in separate classrooms as per Naim’s request. It seemed to go OK for Naim, but Nik went up a few minutes early to get Aaron and he was getting a talking to out in the hall for-and I quote-“an exposure issue.” Which Nik had to process for a minute that this meant he mooned the class. (insert big, fat, exasperated eye-roll here.) So, he seemed embarrassed and was talked to by all of us about the inappropriateness of it. But he does this thing like he is so scared when he gets in trouble . (He balls up and puts his finger in his ears and starts whimpering about how scared he is.) I think the people must think we beat him or something, but it is kind of all for show, I guess. Or it is that he doesn’t think about what he is doing and gets surprised when he gets in trouble for it so it seems like a big, scary thing to him. Oh, I just have been informed, it wasn’t mooning like I originally thought, it was flashing. EVEN BIGGER EYE ROLL….sigh. After church, I took the kids to their VH back to school picnic. The weather was kind of cold, so it wasn’t a huge turn out, but we talked to Lori and did an art project, they played ping pong and on the playground. 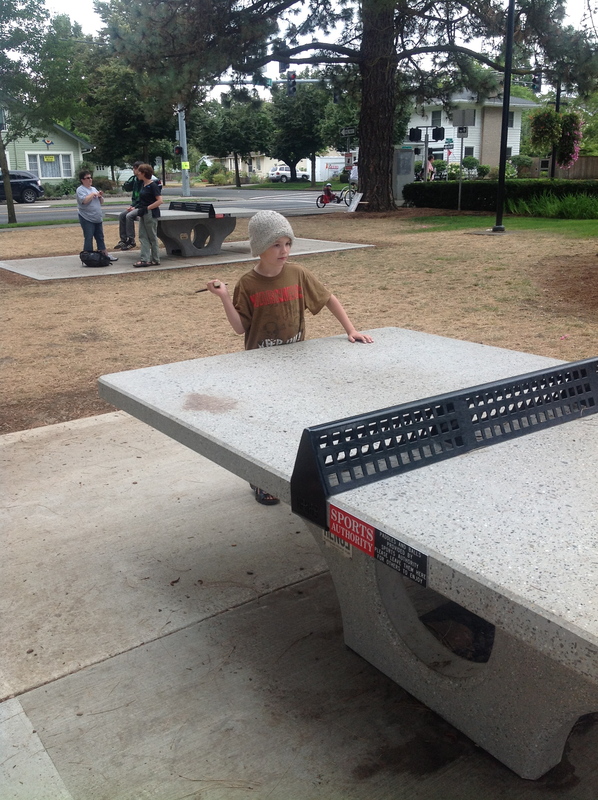 It was ok.
Beaverton Park just put in these ping pong tables recently. 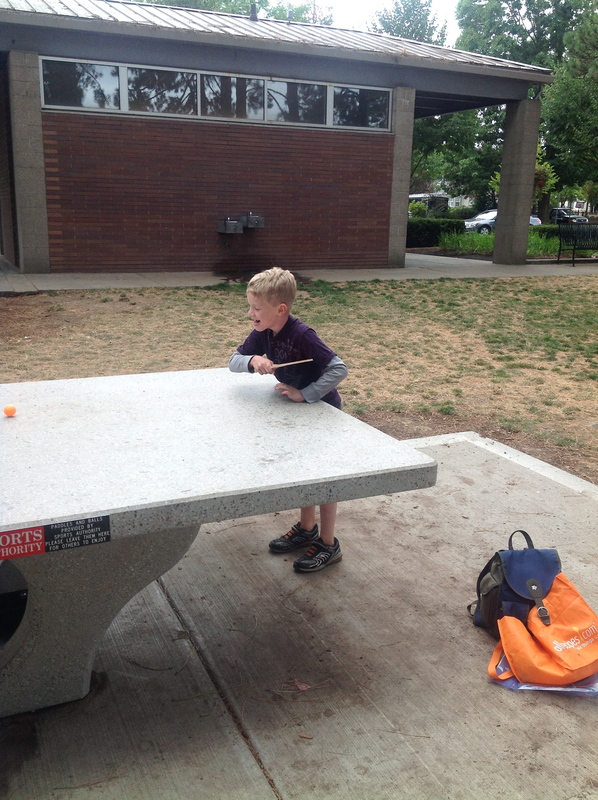 The ping pong stuff was borrowed from VH families. Aaron found that goddawful hat lying on the street and wore it all day.